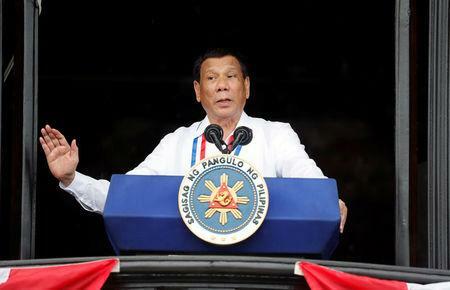 MANILA (Reuters) - The ousted Philippine Supreme Court chief justice launched a blistering attack on President Rodrigo Duterte on Tuesday, calling him a "self-styled savior who is willing to kill", after she lost an appeal against her removal from office. Maria Lourdes Sereno, the first woman chief justice of the Philippines who Duterte denounced as an "enemy" for her opposition to some of his proposals, was ousted by fellow-judges allied with the president last month. They cited violations in the way she was appointed by Duterte's predecessor. She filed an appeal against her dismissal but the Supreme Court rejected it on Tuesday. "Our sights have been set low by the very leaders who should lead us to pursue lofty visions for our nation and our people," Sereno said in a speech to her supporters after the court ruling. "The propagandists would have us pin our hopes on one man – a blasphemous, self-styled savior who is willing to kill," she said. Duterte's spokesman, Harry Roque, declined to comment on Sereno's criticism but said everyone should respect the court's decisions. "Like it or hate it, we have to succumb to the decision of the Supreme Court," he said. "Sereno is no longer the chief justice. We wish her good luck in her everyday life as a private citizen." Sereno, referring to Duterte's efforts to replace top members of the judiciary, the Ombudsman and the human rights commission, accused Duterte of undermining the independent institutions meant to ensure accountability and justice. "It demonstrates the disregard that this administration has for the constitution and the rule of law", she said. Sereno also questioned Duterte's anti-corruption campaign and his bid to constitution to introduce federalism and what she called his "disastrous" economic and foreign policies. She vowed to hold the president to account. "This woman does not back away from a fight, especially if it is a just one," she said but did not say how she will rally the opposition against Duterte.